I've said it before, time and again, but in many ways the Marvel of today is built off the back of two instant-classic books: The Waid/Rivera/Samnee Daredevil and Matt Fraction & David Aja's Hawkeye. The two books showed that there was a demand for colorful, character-driven books that focused more on personal stakes and low-key adventure than grand, world-saving sci-fi action. The old maxim is that one body is a tragedy, while a million is a statistic; part of the power of these series' is that they build a world worth saving. Entire cities may be slain in Avengers in any given month, but none of that matters, narratively speaking, if we don't know any of the faceless, nameless residents who live there. Ant-Man #1 is most comfortable with the little people. 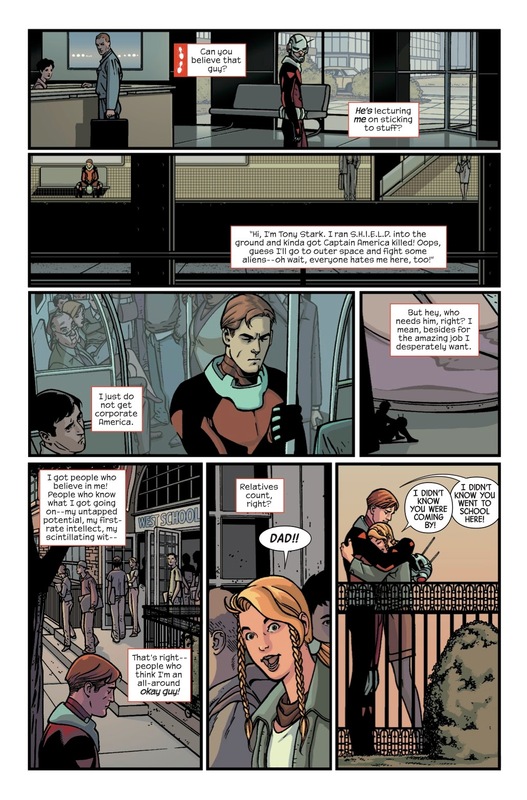 Scott Lang is about as big a burnout as a superhero can be, a reasonably talented thief who tried to get it right after the birth of his daughter, only to find himself terminally bored by the day-to-day grind. Even adventuring as Ant-Man with the Avengers and the Fantastic Four only keep him occupied for so long. But now he's trying to fly straight in an attempt to give his recently-resurrected-formerly-superheroic-though-we-aren't-talking-about-that-apparently (I know) daughter Cassie a chance at having a real relationship with her dad, something he never had. As such, he finds himself... breaking into Tony Stark's apartment to try and help him cheat on a job interview. Nobody's perfect. "Nothing quite stuck, you know?" Nick Spencer is probably best known for his two popular Image books, supervillain horror book Bedlam and Lost-at-Lovecraft's-boarding-school Morning Glories, but Ant-Man finds him in a different mode altogether. Spencer's recently concluded Superior Foes of Spider-Man was an immensely charming book about, in a way, blue-collar supervillainy, and while the series never quite connected with a wider audience it still brought him a lot of good will. Ant-Man is very much in the vein of that much-loved Marvel book, but I think it has the potential to make a far bigger splash because, I'll just tell you this right now: It's really goddamn good. There are growing pains, of course. While I liked the issue a lot, there are a few moments in Ant-Man #1 that feel a bit off. An early, four-page long flashback detailing the character's life story feels like it was jammed in by editors who wanted potential movie-goers to have a quick and easy 'in' with the character, but it grinds the book to a screeching halt. None of it is information we need right there, particularly since virtually every aspect of it is repeated at some point through the issue better, later. Spencer does such a great job showing us how flaky Lang is throughout the issue, for example, that having Lang come out and basically say, "I am flaky," doesn't really add much to things, you know? That said: Hell, but Spencer knows how to write character. I didn't know much about Lang coming in, but between Spencer and the art team, he feels like a fully fleshed-out character by issue's end. While I typically detest extensive use of caption boxes in a comic, Spencer gives Lang a rambling, running narration in his head that seemingly overpowers the world around it, a great way to display the character's neuroses, but it's the nice little character touches that really help sell Scott. The way he spends his money, his relationships, even the way other people talk to him - Spencer has made every little bit of this book important to understanding who Scott Lang is and what he wants, which makes the occasional clumsiness a bit more forgivable. Artist Ramon Rosanos and colorist Jordan Boyd do some very solid work here. Rosanos is an excellent fit for Spencer, because Rosanos does one thing very, very well: He gives his characters a great deal of physical personality. Facial expressions, the way they wear their clothes, the slump of their shoulders when they're dejected - the work is just over-the-top enough to stand out, and I mean that in the best way. Ant-Man #1 is a fairly internal book, most of the drama coming from Lang's desire to prove himself to his daughter (shades of the recent teaser trailer there), which means Rosanos has to make the book feel big even when it isn't. It's there that he excels. Ant-Man #1 is a surprisingly winning book from an up-and-coming writer who understands the importance of building drama around character. With a strong art team and a relatively free-form premise divorced from your typical superheroics, Spencer seems confident that readers will be invested enough in who Scott is and what he wants from his life by the end of the issue to stick with a series that doesn't have an big, obvious hook. It's a good bet, Mr. Spencer; Ant-Man #1 is charming as hell. Ant-Man #1 is written by Nick Spencer, illustrated by Ramon Rosanos, colored by Jordan Boyd, and lettered by Travis Lanham. 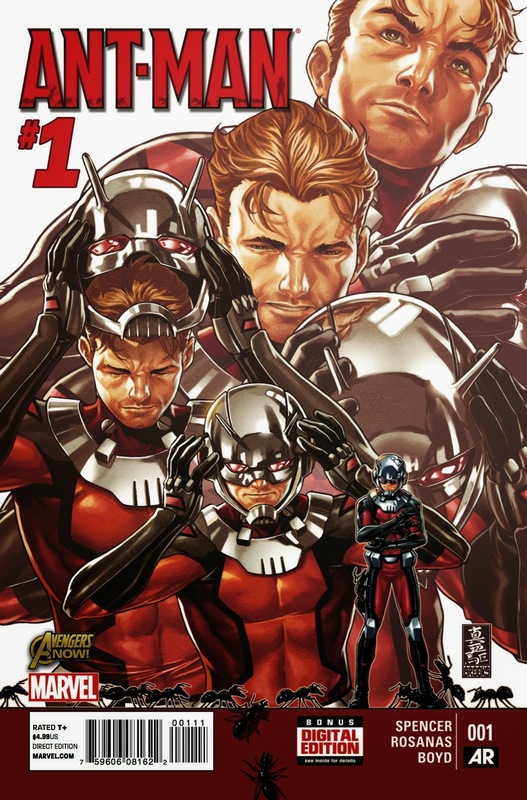 Published by Marvel Comics, Ant-Man #1 was released on January 7th, 2015 with a list price of $4.99.